The Icelandic Horse Farm people are Robyn Hood, Phil Pretty, Mandy Pretty, Walt Woodhead and Christine Schwartz. 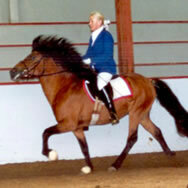 Robyn and Phil became involved with Icelandic Horses in 1976. Christine joined us, from Germany, in 1979. 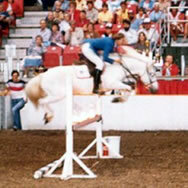 Mandy arrived in 1982 and brought her husband, Walt Woodhead, into the mix in 2007. 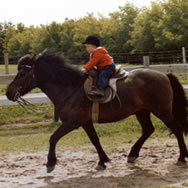 Over the years we have sold hundreds of horses. 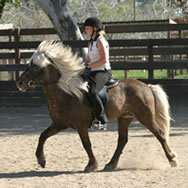 Our horses have spread across much of North America with others in Portugal, Germany, Sweden and Australia. 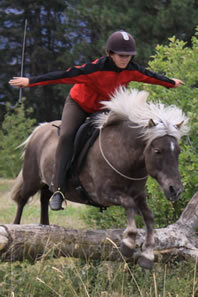 The Icelandic Horse Farm has been breeding, promoting, importing and selling Icelandic Horses since 1976. The farm is located on a picturesque 65 acre bench just outside Vernon, BC overlooking the Coldstream and Whitevale valleys. Many of the horses spend the warmer months in additional summer pasture in close proximity to the farm. A Cover-All arena allows horses to be trained year round. 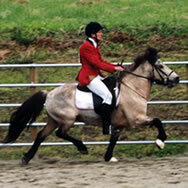 View videos from the farm as well as horses for sale. Our business and life revolves around these amazing horses on 65 picturesque acres just outside of Vernon, BC. Service is the cornerstone of our business, and we are here for you both before and after horses are purchased from us. We extend a suitability guarantee for trained horses to ensure satisfaction to new owners and horses alike. 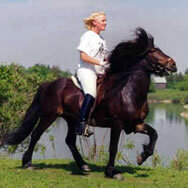 (Consignment horses by private agreement.) 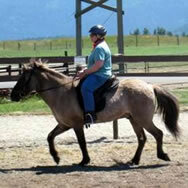 Both domestic and imported horses of all ages are for sale; mares, geldings, and young horses. We'll keep you informed about events and horses for sale. Tellington TTouch Method is the training method we use. Invented by Robyn's sister Linda Tellington-Jones, it is Tellington TTouch is a training approach that encourages optimal performance and well-being. The Canadian Headquarters is at the farm. 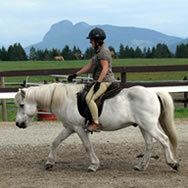 We also offer numerous clinics on riding, starting young horses, and TTouch. Our online shop offers saddles, tack, and apparel, as well as many books and DVDs. Please make yourself at home, and have a look around! © The Icelandic Horse Farm. All Rights Reserved.